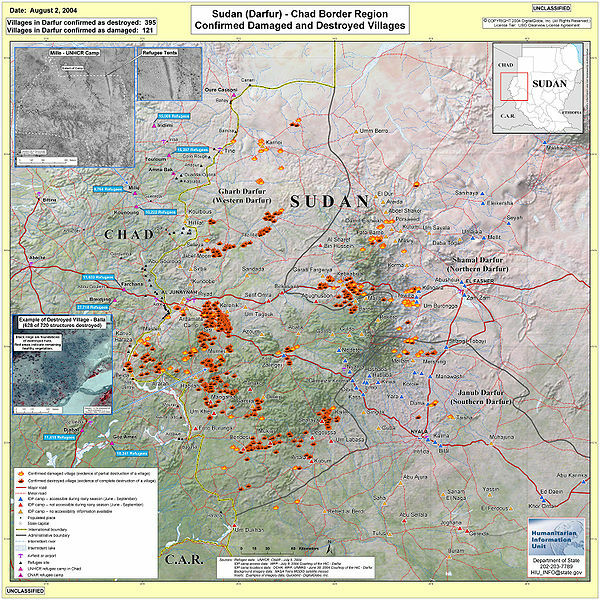 According to a UN report mentioned in the Guardian online newspaper, “The conflict in Darfur has been driven by climate change and environmental degradation, which threaten to trigger a succession of new wars across Africa unless more is done to contain the damage.” This suggests that one of the root causes of what President Bush called“genocide” in Darfur has been drought and desertification. Many have claimed that the War in Darfur is the first war which stemmed from a lack of natural resources due primarily to climate change. They assert the disconcerting reality, that the inability to curb climate change will result in similar wars in the future. “The Sahel region of sub-Saharan Africa has been severely affected over the last twenty years by desertification which some climatologists attribute to global warming. Severe droughts have become more frequent in both Darfur and Chad. These droughts and general alterations in rain patterns have affected migration patterns of Darfuri nomadic tribes who breed cattle and camels. These changes subsequently led to increasing clashes between nomadic and sedentary farmers about the traditional land-tenure system. Most disputes, however, were handled through traditional means of consultation and arbitration. Obviously, SaveDarfur.org believes that the root cause of the conflict lies in tribalism and political unrest. They seem to claim that environmental factors were merely a spark for a much larger conflict. And it is true that much of the unrest was due to a government which suppressed its people and acted rashly in its arbitration between North Sudan and South Sudan. SaveDarfur.org makes a very valid argument against the notion that the entire war was based on the allocation of water resources. However, the fact remains that many of the militant members of the Janjaweed and other rebel forces acted out of desperation and poverty in contrast to political idealism. With rainfall down by around 30% over 40 years and the Sahara advancing by well over a mile every year, tensions between farmers and herders over the ever-diminishing pasture-land and evaporating water holes caused more political turbulence than would have otherwise occurred. The controversy, perhaps, is whether environmental factors were the spark for the armed conflict in Sudan, or the fuel. Was the root cause the idea of “ethnic cleansing” among members of the Janjaweed, or was it the overall lack of natural resources necessary for sustaining life? The impact globalization has had on this issue has been enormous from both perspectives. Assuming that the issue is the allocation of resources, globalization and industrialization have supposedly both had a significant impact on climate change and therefore drought and/or desertification. If one chooses the political perspective, one can accurately assess that the almost continuous conflict between Sudan’s diverse regions is a testament to the fact that modern Sudan, with its present borders, is a construct of colonialism. Many have suggested that the uneducated drawing of borders during the imperialist nations’ “Scramble for Africa” has been a significant reason for East and Central Africa’s inability to compete on the global scale. In other words, the fact that people of different tribes and cultures are forced to live in the same parameters is part of the reason for which they are constantly at odds. There are, of course, other factors which led to the conflict in the Sudan, some which are even more significant than both the environment and Sudanese tribalism and politics. The website below does a phenomenal job of laying out the possible reasons for the conflict as well as how to combat it. 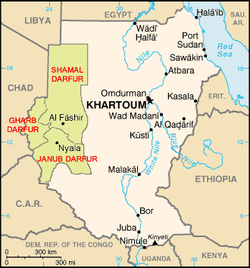 However, the true cause between the War in Darfur is so complex and varied that nobody can pinpoint it with precision. However, it is completely accurate to claim that environmental causes were a major factor in the origins of the conflict, and desertification and deforestation are still major issues facing Sudanese people today. The following is an interactive crisis guide which unfortunately could not be embedded.